a 52 year old male presents to your Emergency Department with more than 24 hours of typical sounding, retrosternal chest pain. He has a prior history of ischaemic heart disease & an LAD stent placed 3 years earlier. P 136/min, BP 104/60 mmHg, SaO2 92% (RA). RR 30 with slight bilateral crackles. “Tombstone” STE V1-4 [max ~5mm] w/ associated Q-waves. Concave-up STE [1-2mm] in inferior leads [II, III + aVF]. Widespread ST-segment elevation consistent with acute anterior “tombstone” ST-elevation myocardial infarction meeting reperfusion criteria. The presence of tachycardia, basal crackles and borderline hypotension is concerning for early cardiogenic shock. 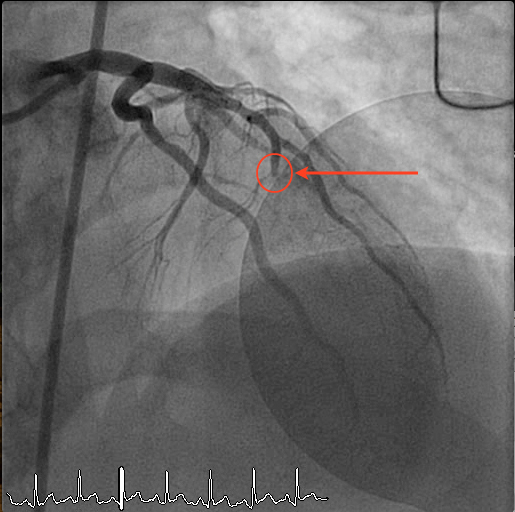 This patient warrants early Cardiology involvement and prompt transfer for PCI. Despite the inferior changes, the RCA was pristine. Simultaneous ST-segment elevation in the precordial and inferior leads. In the presence of anterior STEMI, the amount of ST depression in the inferior leads is typically predictive of a more proximal LAD lesion. Even in the presence of a wrap-around LAD (ie. with inferior wall transmural ischaemia), almost all LAD occlusion proximal to D1 is show inferior ST depression. A more distally occluded LAD is thought to be a prerequisite for isoelectric inferior ST-segments. Additional ECG findings suggestive of a wrap-around LAD include ST-depression in lead III (with a positive T-wave) associated with ST-elevation in aVL. Occurs due to an occlusion of a variant “type III” LAD. This wraps around the cardiac apex, supplying both the anterior and [partial] inferior walls of the left ventricle. 24 yo woman with chest pain: Is this STEMI? Pericarditis? Hyperacute T-waves, with a Twist. Interestingly, the combination of anterior and inferior ST-segment elevation appears to be associated with limited AMI size and better preserved LV function (when compared to anterior STEMIs with either isoelectric or depressed inferior ST segments). Sadanandan, S., et al. (2003). Clinical and angiographic characteristics of patients with combined anterior and inferior ST-segment elevation on the initial electrocardiogram during acute myocardial infarction. American Heart Journal, 146(4), 653–661. Engelen, D. J., et al. (1999). Value of the electrocardiogram in localizing the occlusion site in the left anterior descending coronary artery in acute anterior myocardial infarction. Journal of the American College of Cardiology, 34(2), 389–395. Porter A, Sclarovsky S, Ben-Gal T, et al. Value of T-wave direction with lead III ST-segment depression in acute anterior myocardial infarction: electrocardiographic prediction of a wrapped left anterior descending artery. Clin Cardiol 1998;21:562–6. Gibson, CM., et al. (1996). TIMI frame count: a quantitative method of assessing coronary artery flow. Circulation. 1996 Mar 1;93(5):879-88. Anterior myocardial infarction – Life in the Fast Lane. 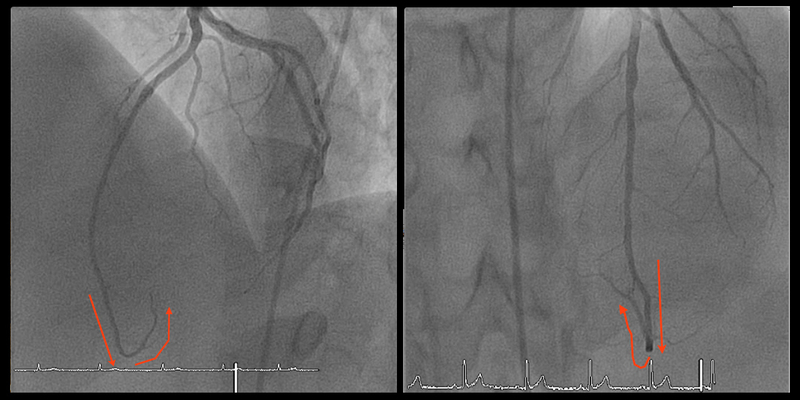 Excellent case – with superb angiogram illustrations pre- and post PCI. Always NICE to get cath and clinical correlation to clarify initial ECG findings. Several points about the entity of simultaneous Inf. & Ant. ST elevation. ii) Clue to whether simultaneous Inf + Ant ST elevation is more likely from RCA vs LAD wraparound occlusion may be forthcoming depending on if ST elevation is max in V1,V2 (rca occlusion) vs V3,V4,V5 (lad occlusion). iii) With LAD occlusion – when proximal – one often gets inferior ST depression (as well as ST elevation in aVL, aVR, V1) – vs a more distal LAD lesion – in which there may be NO reciprocal ST depression in inferior leads (and less or no ST elevation in aVR,V1,aVL). iv) As mentioned – LAD wraparound occlusions are often not proximal but rather mid or lower. The ECG can provide clues to that (iii).